Josh Kim wrote a post yesterday at Inside Higher Ed questioning some claims about the LMS market size. The first result that comes up in Google is from Zion Market Research. Their estimate is that the global LMS market is valued at $5.19 billion in 2016, and expected to reach $19 billion by 2022. According to Statista, the LMS market in 2016 was valued at $3.21 billion. CNBC claims that the learning management system market is worth $5.2 billion today, and will grow to $16 billion in four years. Josh then did a quick analysis based on Instructure's revenue and came up with much smaller numbers. If we assume that the cost of Canvas is about average for LMS companies, we can get an estimate of the total market size by multiplying Instructure’s revenues by five. This gives us an estimate for the total size of the LMS market $555 million. He extended this by 50% based on Instructure growth to give an estimate of $555 - $832 million, which is way below the big numbers claimed by Zion, MarketsandMarkets, and other market analysts. The biggest difference here is that all of these analysts combine corporate learning markets with academic LMS usage, and corporate learning platforms account for somewhere between $2 - $4 billion, with best estimates (although outdated) coming from Bersin. This point has already been pointed out in the comments at IHE. tl;dr - the ~$5 billion number is reasonable if you combine academic and corporate LMS markets. There are two caveats, however. First, the market growth claims are marketing fluff to generate interest in buying the reports, as companies love to show growth potential to investors. Anything close to $20 billion in a few years is ludicrous. One issue from the IHE post is that Josh used our 20% market share as basis for extrapolating Instructure's market share, but that number is only for North American higher education. Globally, Instructure's market share is much smaller as shown in our recent analysis (data provided by our partners LISTedTECH). Furthermore, while Canvas by Instructure and Schoology seem to be leading vendors for new adoptions in the K-12 market, at least in the US, no one has reasonable measures of market share in this area. Long and short - we need a different approach than extrapolation from Instructure alone. 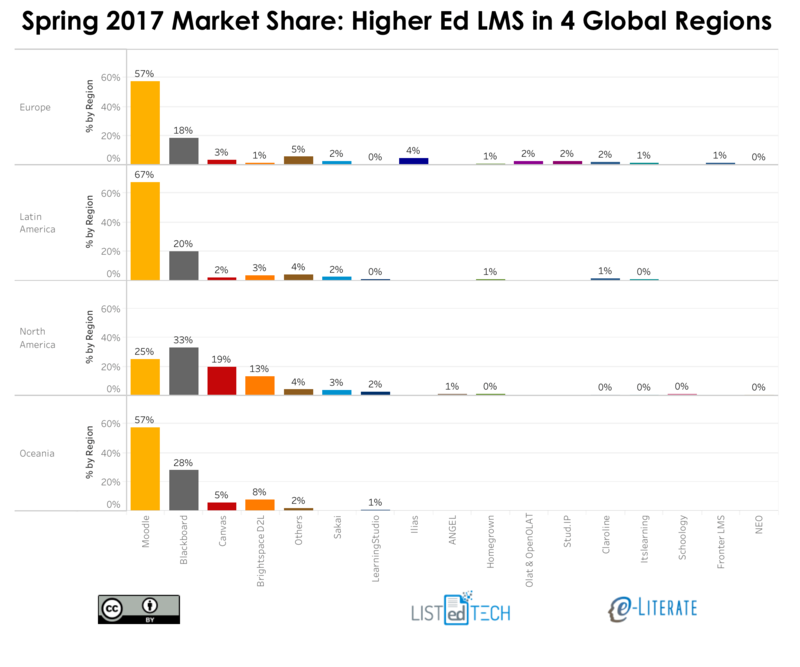 LISTedTECH estimated the global LMS market just in higher education as $1.7 billion based on (# of students) * (average cost of LMS per student) = annual spending approach. In the US, the best estimates I've seen in that K-12 learning platform markets are worth 30 - 40% of higher ed market. This likely is smaller globally, as anecdotally there is not a big emphasis on LMS usage outside North American and Northern Europe. So one very rough estimate is that academic LMS market is worth approximately $2 billion per year. If you want to use the company revenue method, then I would use additional data. Blackboard's LMS revenue is likely $450 - $550 million per year based on reviews of corporate debt filings and extrapolation from their time as a public company. D2L's revenue is smaller than Instructure's, so let's assume the two companies combined have $200 million revenue. Note that in all of these companies this is global revenue for K-12 and higher ed combined. The question is how to scale this $700 million combined revenue from all three companies. Is it reasonable that global spending for academic LMS could be 2 - 3x larger than this number? When you add in all of the Moodle hosting - both Moodle Partners and unofficial Moodle hosting - as well as Chinese market adoption, European providers, and K-12 players like Schoology and Powerschool/Haiku, this seems at least believable. So my highly-researched, thoroughly-documented estimate of the global academic LMS market is $1.5 - 2.0 billion per year. And it is forecast to grow to $8.2134526 billion by June 3, 2022. Note to investors - ignore that forecast.